When I first started paper piecing, I was scared of printed fabric and top list of designers whose fabric I never thought I'd use was Kaffe Fassett. The bold prints, the high contrasts- it all just seemed too much. I was worried that the prints would interfere with the clear sharp lines of my paper pieced designs. These days I have conquered my fears. I embrace the challenge of finding the perfect printed fabrics to sew with and I love the extra dimension that Kaffe Fassett's amazing and vibrant fabrics add to my sewing. When I was given the opportunity to work with Kaffe Fassett's Artisan Fabrics in the new Red and Pink colourways, I couldn't resist! My first impression on seeing the fabrics was that there were a couple of prints which were perfect for Lions manes. 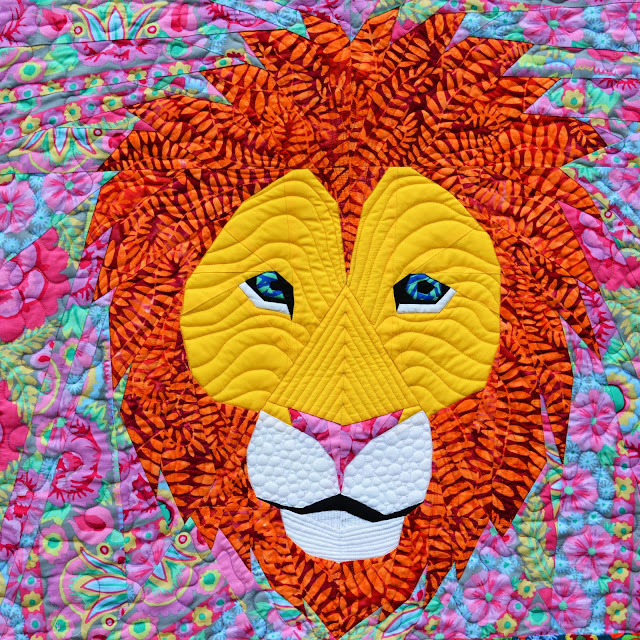 It seemed like a great opportunity for me to make a lion in preparation for my class at the New Zealand National Quilt Symposium. 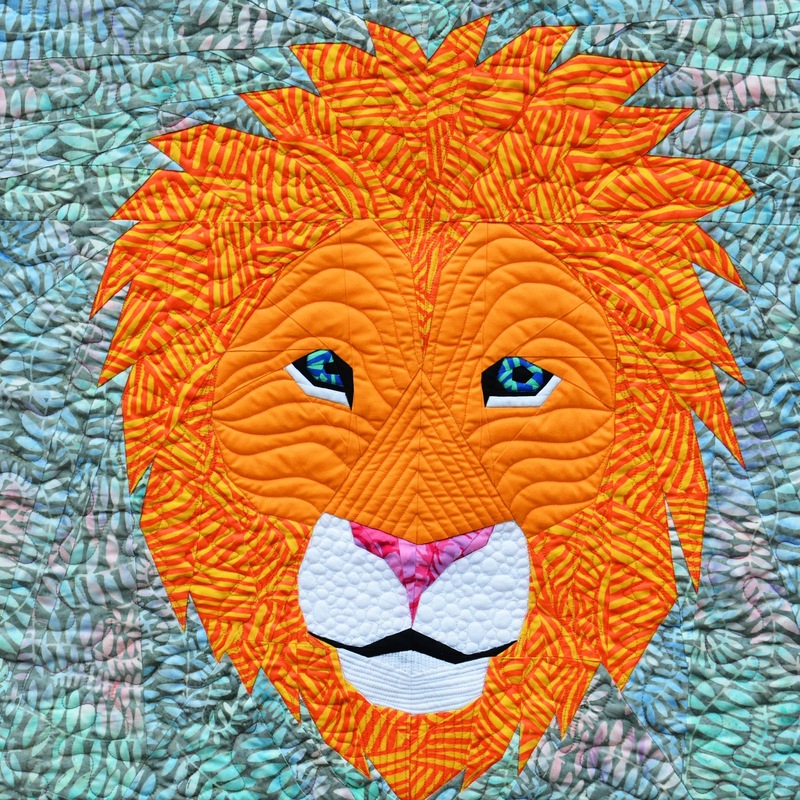 The lion pattern is one that I designed a couple of years ago using Electric Quilt 7. 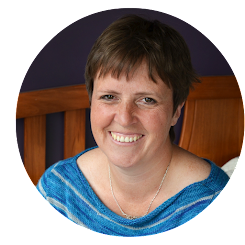 Returning to it, I quickly realised that my first job was to update the pattern. I have learnt a lot since I initially released it and I wanted to improve the formatting of the pattern pieces and to present the diagrams in a manner that is more representative of my current patterns. If you have previously bought the lion pattern, you should now have access to the updated file. Once the pattern was improved, I made the first lion. I was initially a bit cautious about the batik mane fabric, but I love how it worked together with the floral background and solid face. I loved it, but still had a ton of fabric, so I picked another set of fabrics and made another lion. At this stage, I had to stop and think. I knew that the logical thing to do would be to keep going and sew some more lions, but I have a low attention span for repetitive sewing and I knew that I would struggle with sewing another two lions. I took the opportunity to play with layouts in EQ7. I tried two block quilt layouts. I tried 4 block layouts both with sashing and without sashing and finally accepted the inevitable, I needed to keep piecing lions. The third lion went well. I wasn't initially sure if I had made a good decision for the mane fabric, but I love how the flowers work and I think that the contrast between the different aspects of the design is great. The fourth lion was a bit struggle. I was chronically unsure about the fabrics- they are a lot more busy than I normally use and the repetition of sewing lions was beginning to get to me. I kept working and got there in the end. I was still unsure about this final lion when I went to the Canterbury Modern Quilt Group's monthly sew day, but I was amazed to find that everyone responded to this block the best! On it's own, I think I would have dropped this block, but when put together with the other lions, he works well. I had fun putting the quilt together and must admit that I really love the finished quilt. Leeanne Hopper- Quiltmekiwi did a great job on the quilting as always. 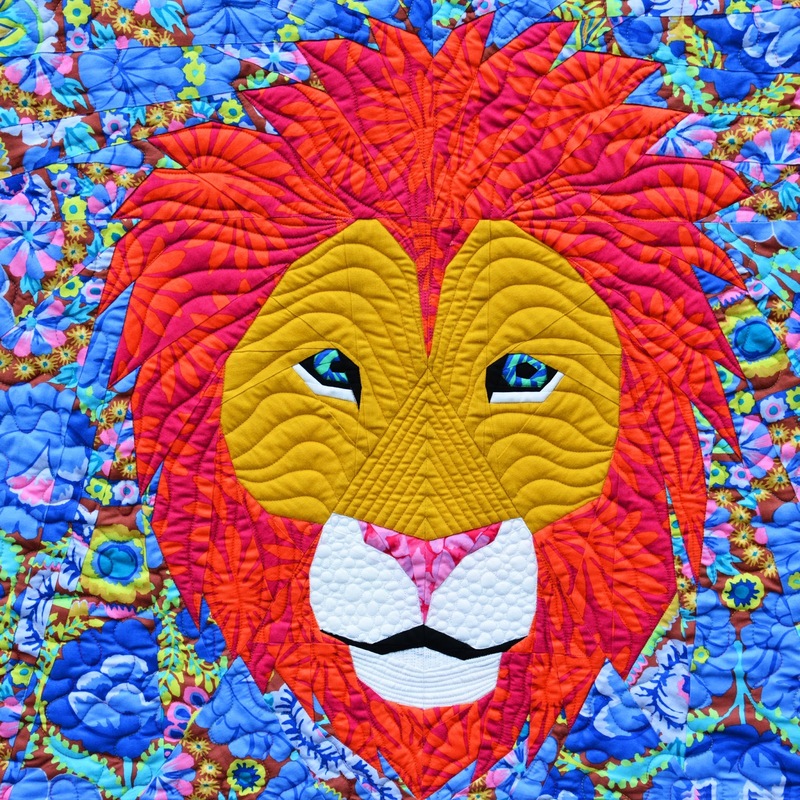 I am currently in the process of producing a printed paper pattern for this lion quilt, but I have a problem! I can't think of a decent name for it. Please help me, I'd love to hear your suggestions. If you provide a name that I love, I will send you a printed version of my pattern (when it is finished). It is so cute! When I start with patchwork, I thought only Kaffe Fassett-Fabric will be the right. Now, 3 years later, I don't use these fabrics. But you show: this is the right choice and I will use my Kaffe Fabric stash! An idea for the name: "Samba" or "the King"
Gorgeous lions Juliet - you know I would have struggled working with that fabric but you did well - what a result! What an amazing quilt! Gorgeous job with the fabrics. Love all four lions together. I love this quilt. There's something about those eyes!! Beautifully done. I can't help but think that those lions are shaking their heads saying, "It's all about the mane!" And then I thought that would make a great pattern name! Wow Juliet! These are magnificent! 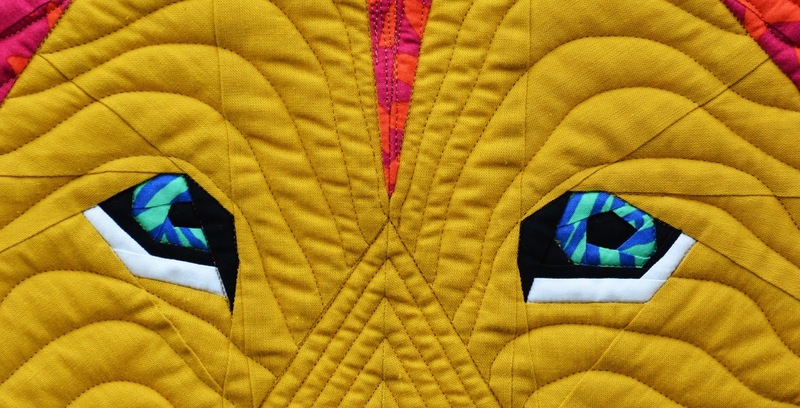 Those eyes just drew me in and it was instant love - genius of you to choose that fabric for the eyes! How about "Manely Kaffe" for the name? For your group of four - I suggest "A Pride of Lions". Lovely and amazing! I like the one with the blue background best, but the bottom right one really sizzles. Still thinking about titles, but "Proud Lions", "Mane Pride" and "Lofty Leos" come to mind. 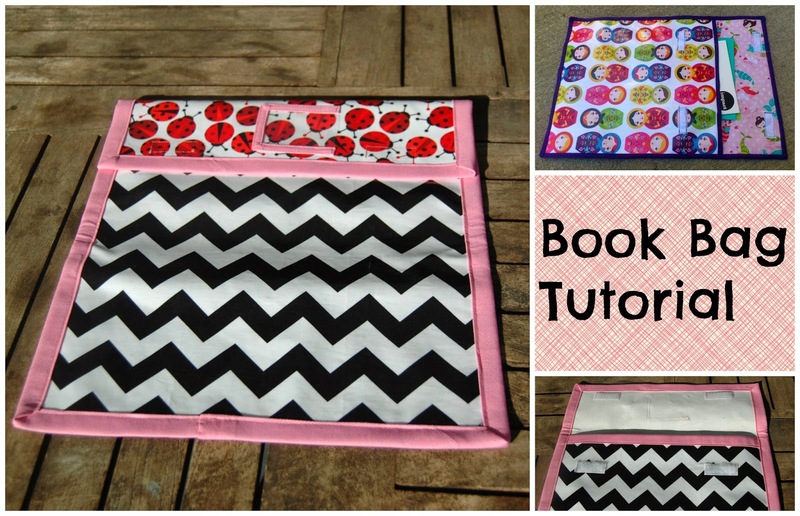 I would never have thought of putting these fabrics together, but it really works. The bottom left is my favorite. 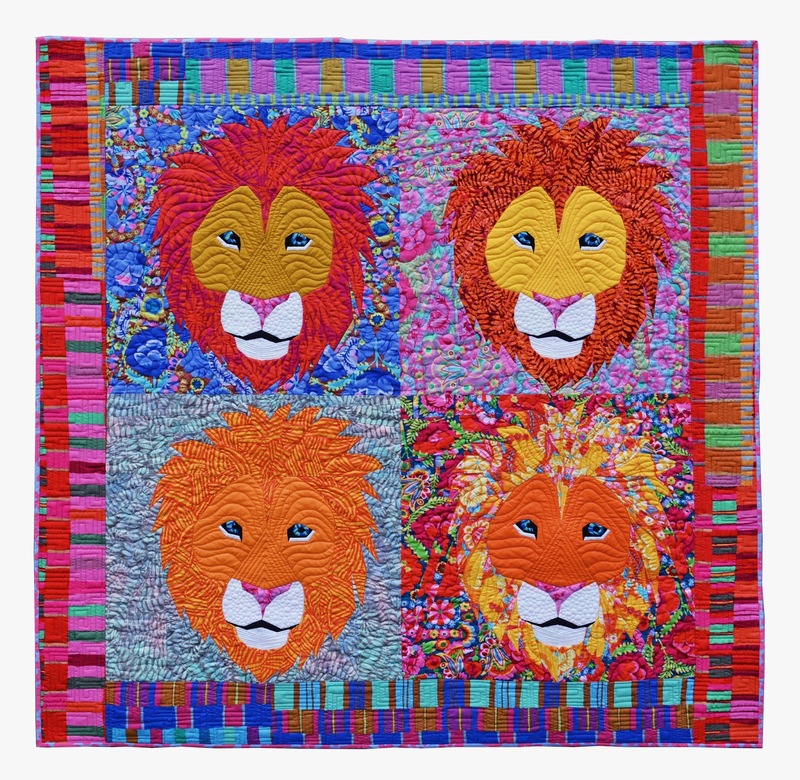 I am not good at naming quilts or patterns, but these lions look happy and so I would call it happy lion(s). Another possibility is "perfectly coifed lion" or maybe, "I am lion--hear me roar." Den of Lions. I've never been a fan of solid fabrics, so, I try to use printed fabrics when I can for paper piecing. I just bought some printed fabrics for a pattern that I'm testing for the designer. Mine is for dog fur (Katie Nana from Peter Pan). Great Lions you made. Rory the Lion! Or Parsley the Lion if you remember him. "Let out the Lions" from Gladiator days!!! I'm having trouble with my browser recently, not sure if this posted, my screen hiccuped, so forgive me if posted twice. I liked that 4th lion the best :) It's a lovely quilt with lovely fabrics, the lion's eyes really caught my attention, the facets sparkle so I thought a play on the spelling of his name. 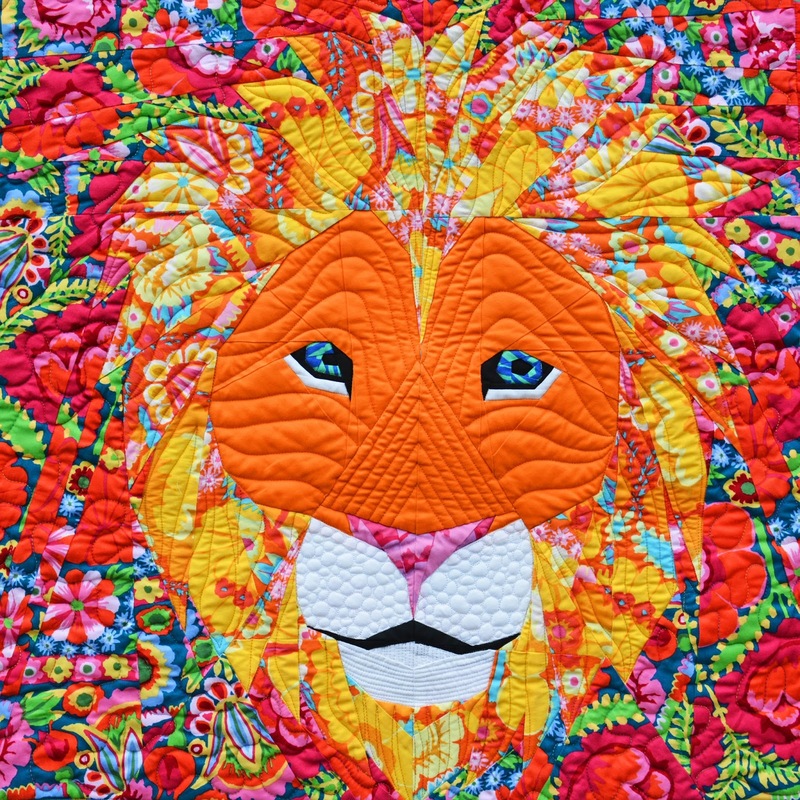 "Lion with Fassett-ed Eyes"
Great use of the patterned fabrics! I'm still scared of them. All I have in my head now is that song; in the jungle, the quiet jungle, the lion sleeps tonight....wimowe... Sorry if it's now in your head. Just a question but is there a reason the lion is off centre in the blocks? Great choices on these guys - especially with the manes. those big print fabrics can be intimidating on the bolt, but you rocked it! Suggested name: Mane Event! Did you name this pattern yet? I would keep it simple: Leo. The power of these lions speaks for itself. Now I need to try paper piecing! Oh my, these lions are glorious! Good on you for going out of your comfort zone, what a super result!